Annual festival concerning the role of digital technologies in contemporary society. The first week of February saw the latest incarnation of transmediale: Germany’s preeminent meeting-ground for art and technology. Like it’s institutional big-brother Ars Electronica (taking place yearly in the Austrian city of Linz), transmediale is amongst Europe’s highest esteemed media arts festivals. Through workshops, lectures, multiple exhibitions, film and video screenings, performances and concerts (presented by transmediale musical counterpart clubtransmediale) the festival purportedly addressed activism, social openness and liveness in digital and network technologies. Further, this year’s line-up saw a network of satellite partners operating under the title Das Weekend, more or less concerned with digital media culture (of notable merit were Kunstquartier Bethanien and the transient Future Gallery). The festival yielded a wide range of perspectives, goals and ambitions: futurist harbingers of fully tech-integrated societies wherein the body and communication take on new roles; activists who fear the loss of culture and privacy, and map exit strategies from our increasingly tech-reliant cultures; and artists, working in diverse media, who articulate cultures impacted by new technologies. The celebrities here are researchers, hackers and media-practitioners – not those who grace the surface of Artforum. Pasty-faced, bespeckled nerds, they are allstars of online and remix cultures: hacktivist radicals and creative-commons heads of the Pirate Bay and 4chan; heavy-hitters of contemporary philosophy, like Maurizio Lazzarato; cyberpunk chicks with angular haircuts or up-and-coming Japanese artstars. This year marks the centennial of Canadian media guru Marshall Mcluhan and proportionately much of transmediale’s programme centred on the materiality of media. Central to the theme of transmediale was an attempt to define ‘liveness’, after its apparent mutation in the digital age. How do tech media affect presence and communication? Are the plazas and piazzas of old Europe mediated by technology? Is Chatroulette more or less intimate than Facebook? These were among the questions tackled at the Haus der Kulturen der Welt over the course of the festival. Accommodating the bulk of the programme, the HKW housed a collection of exhibitions, workshop sites, screening rooms and lecture halls. The HacKaWay Zone resembled, for better or worse, a conventional gallery space. In it, process-based and performative artworks, often interactive and hands-on, scattered the HKW. 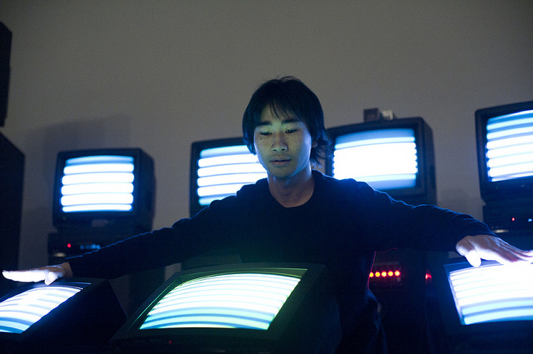 It’s here that we saw the performance work of Japanese artist Ei Wada: a definite crowd-pleaser whose amateurish use of antiquated Braun-tube televisions led to unexpected harmonic percussion. The main foyer of the HKW was allocated for The Open Zone – an assemblage of flimsy display structures housing workshops and presentations against the sleek institutional backdrop. This experimental project space (a digi-festival token) held a live, peer-to-peer playground for all things socio-political in the digital realm. Aside from some of the more renegade, collaborative sessions there, the programset-up showed how far we still have to go in terms of embodiment and physicality in digital media. In a clear transmigration from virtual to real planes, the veritable anti-capitalist Mickey Mouse of free culture, Angel_F, materialized around the festival. This fictional, childlike “artificial intelligence” is, as creator Salvatore Iaconesi told me, the offspring of cybersex. The invasive, genderless creature contends for digital liberties, knowledge sharing and identity fluidity. 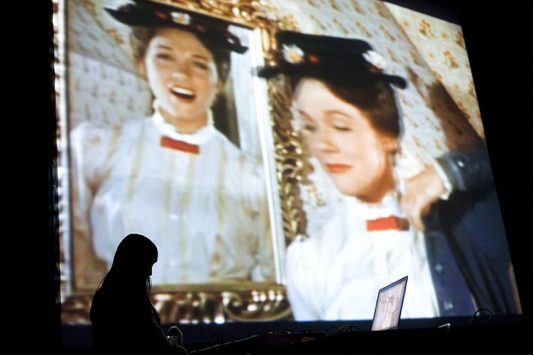 Most progressive of transmediale.11’s program was the BODY:RESPONSE conference. Spotlighting “biomedical politics in the age of digital liveness”, invited theory-bigwigs articulated points from the acme of performance, economic and media theory. Their ideas spanned between atoms and bits, cells and circuit – between the bodily and the virtual. They elaborated our cultural dependence on technology, and its implications in the ‘real’ world. The very palpable corporate implications in digital technologies were the origins of Paolo Cirio and Alessandro Ludovico’s Face to Facebook a project in which the duo constructed a dating website (Lovely-faces.com) from a million profile pictures stolen from Facebook. 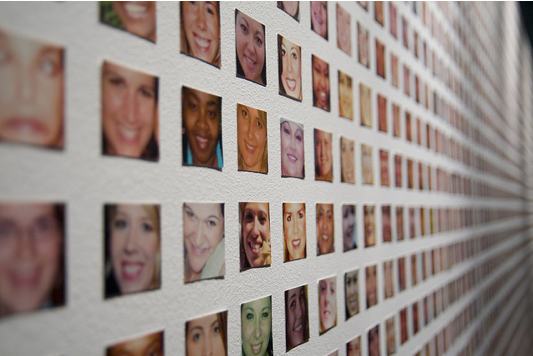 The portraits were analyzed by the artists’ custom program to classify and connect people based on their “facial types” (‘easy-going’, ‘smug’, ‘sly’…). “Face to Facebook” focuses on the privacy controls and commercialization of the Goliath social-media site. As I write this, Facebook takes legal action against the duo and the website is offline, as is a second Facebook-related project, the virtual-suicide service Seppukoo.com by Les liens invisible. An unfortunate standard in many ‘new media’ exhibitions, transmediale being clearly no exception, is a reliance on process and execution of technology itself before any content, craft or artistry. They have a tendency to flaunt new technologies, often selecting artist for their illustrative approaches, or miscontextualizing their work altogether. The emphasis thus is often on realization instead of content. At best, this lends to a self-scrutiny of the respective technology. At worst it leans on a technological trope: Paul Vanouse’s DNA-imaging artworks are a clear example of this form-over-content disposition. In definite contrast, the thorough and varied theoretical programming at transmediale.11 showcased the use of tech media by activists, hacktivists and futurists of many types.